Musings, ramblings, and other writings of a mind looking for the mind. Photography, poetry and prose. Plants have had a long role as signifers of meaning in Japanese culture. Nowadays we are used to seeing a minimal palette of plants in Japanese gardens, though whether this has always been the case is arguable. 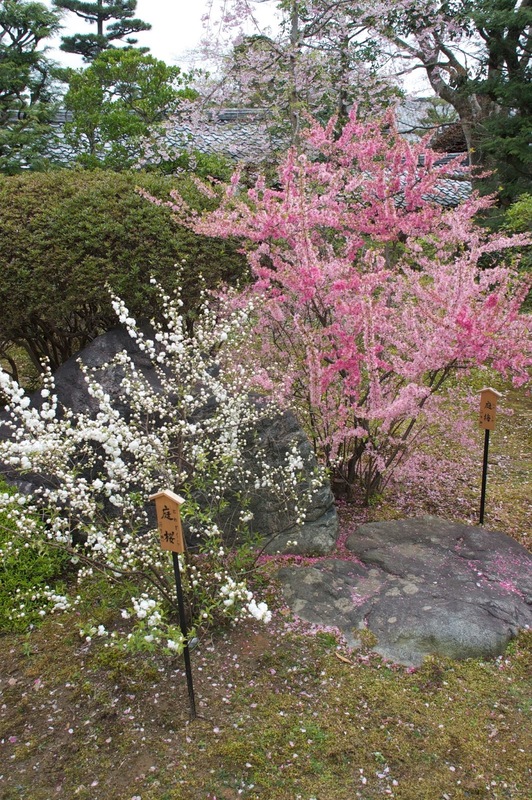 From sources such as the ‘Tale of Genji’, one can see that people were familaiar with a wide range of plants, many of which must have been grown in garden areas. Some plants were appreciated primarily for aesthetic purposes, but many plants were significant for the qualities that the viewer projected on to them. These were primarily emotional and moral qualities that would have been seen as being transferable to the viewer. The aesthetic beauty of the plant was one concern, but its associations were of equal importance. The list of plants and their symbolic associations is long, of course Japan is not the only culture where plants and flowers have symbolic designations, it is something that occurs in many cultures across the world, and has done for millennia. Hana no Kotoba (花言葉), literally ‘flower words’, or the ‘language of flowers’, was a system of classification of plants and their associated qualities. 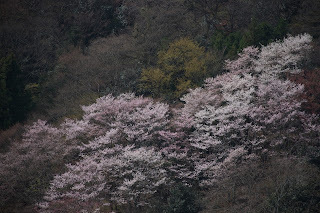 For example cherry blossom, which is so closely associated with Japan, was appreciated for the quality of transience. It’s season being short-lived and also being subject to the vagaries of the weather gives the cherry blossom season a poignancy, and emotive quality that can be deeply felt. Likewise plum blossom (Prunus ume) which flowers in Japan at the end of winter during a time when little else is in flower and the weather still cold, was prized as a symbol of resilience and fortitude, because it flowered when the weather was still cold and the flowers appear on branches still bare of leaves. Pine trees have long been associated associated in both Japan and China with the quality of longevity and hardiness. Bamboo was regarded as a symbol of perseverance, tolerance and fortitude. Nandina domestica (Nanten or Sacred Bamboo) was looked upon as being a purifying plant, a quality of considerable importance in the Shinto world conception, and the shrub was frequently planted in the environs of a latrine. Azaleas, which are much used in Japanese gardens today, are associated with modesty and humility, presumably because they do not grow to any great height, though they can be spectacularly colourful in flower. Citrus tachibana, a form of orange tree was often planted on the south side of the main residence of Heian period mansions (particularly in the compounds of Imperial residences), and the scent of the blossom was prized for evoking memories. The lotus has a profound significance in Buddhism; the roots of the plant are in the mud at the bottom of a pond, which symbolizes the difficulty of the human condition, but its flower is pure white, which symbolizes the purity of spirit that can be achieved by following the teachings of the Buddha. The lotus flower feature in the teaching of the Buddha Siddhartha, and is one symbol of the religion as a whole. Lotus plants are frequently found in the formal pools which feature near the main or formal entrance to a Buddhist temple complex. The symbol of the Imperial family in Japan is the chrysanthemum flower. These flowers were widely cultivated in Japanese gardens, not simply because of the Imperial connection, but also because the flower was associated with the autumnal season, in a similar way that the cherry is a flower defining the spring season. The full list of plants with emotional associations is considerable. In Heian period Japan the lives of aristocrats were dominated by a series of religious festivals throughout the year, among these were several associated with plants, for example the Hollyhock festival, Iris festival, and the Red Leaf festival, were all significant events associated with plants. At New Year pine branches were also arranged in houses, signifying continuity and prosperity for the household. 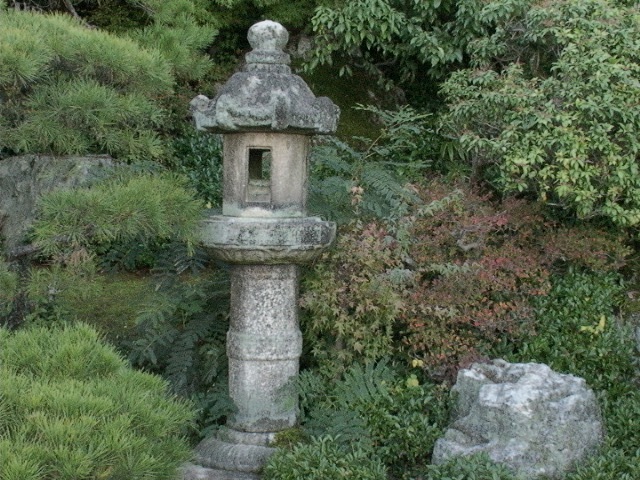 Kasuga type lantern as focal point. Stone lanterns, which originally lined the approach path to shrines, were incorporated into gardens by Tea masters from the 16th century, and have become a familiar focal point in many gardens. There are many styles and sizes of lantern, but they all hold to a common pattern that have symbolic meaning. Lanterns (ishi tōrō (灯籠) are composed of five component parts, which relate to the five principal elements of Buddhist cosmology; earth (地), water (水), fire (火), wind (風) and sky (空). The entire lantern is a symbolic map of the Universe. The earth element (地) is represented by the foot, or stem, that part of the lantern that touches the ground; the earth element encapsulates the emotional qualities of stability and physicality. The earth element represents all that appears solid and with form, also that which appears not to change or at least to change very slowly. The next section, on which the fire-box rests, represents the water element (水). In Taoist thought water represents the formlessness of things, inferring the qualities of adaptability, growth and development. Plants are an example of the water element, their growth adapting intimately and flexibly to the specific environment they find themselves in. 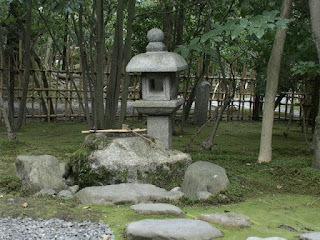 The fire-box section (the section of the lantern where a light would be set) represents the fire element (火). Fire represents movement or primal energy of the Universe. In human terms fire represents intention, will and desire. The cap section of a lantern set over the fire-box represents wind (風), this element is associated with growth and expansion, and the human mind. The very top section of a lantern that looks like a ‘bud’, pointing towards the heavens or sky (空). This represents pure energy, or the transcendence of the material world. Transcendence of the body leads to an understanding of the interconnectivity of all things. In human terms this section represents compassion and wisdom. 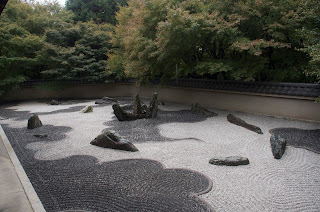 Another symbolic reference used in gardens is the sekimori ishi (関守石). Literally, a ‘boundary-marker stone. In Edo period Japan travel was restricted and routes had barriers or checkpoints where travellers needed to have their authorization to travel checked by guards. 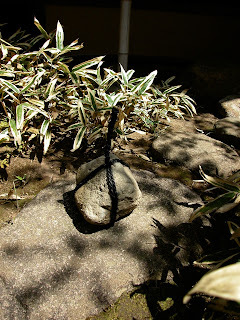 It is a rounded stone, big enough to comfortably fit onto the palm of a man’s hand, which is wrapped around twice at right angles, and tied off with black kainawa or sisal cord. It is essentially a convention from the Tea garden that may be sometimes found in other styles of garden too. The meaning that the placement of a sekimori ishi on a path indicates is that the path ahead is closed, and visitors or guests are to take an alternative path. In a Tea garden it may be used to guide visitors down a certain path from where a particular seasonal treat in the garden may be observed. Sekimori it bound with black sisal string. An enduring impression of the Japanese garden comes from its creation of an idyllic landscape setting. However mannered and sophisticated the design, it remains wedded to the aesthetic sense of rusticity (sabi). The image of the idealised rustic retreat is deeply rooted in the heart of the Japanese garden, where it becomes a place detached from the travails of the everyday world. The garden is intended to engage the viewer in an elevated, transcendental, level of engagement. From the beginning of garden making in Japan, this interaction between viewer and garden, has been one of the driving forces in the creation of the gardens. Without this pronounced concern of the garden-makers, the gardens would have become relatively sterile spaces, filled with grand artifice, but lacking soul. The use of symbolism in the gardens is intended to provide a certain language of engagement, formulating a common ground between viewer and garden. Shinto as a religion places the landscape, and elements of the landscape core of its spirituality. The supplicants address their gods in the landscape and through the landscape. Part of the result of this process has been to develop an extreme sensitivity to Nature in all the Japanese arts, a close proximity to the perceived qualities of Nature, revealed through the willingness to observe and appreciate the smallest detail. The elements of the landscape, trees, rocks, mountains, streams, and so on, are regarded and appreciated as being ‘alive’ in every sense. The garden was a creation that proceeds from the idea of concentrating, refining, condensing the elements of Nature, to recreate Nature in a supercharged form. In doing so the garden is intended to act a filter, removing the impurities (stresses) of daily existence, and rekindling a positive charge or energy within the viewer. The garden acts as a healing or restorative space, protecting and nurturing the household and the occupants. The presence and use of symbolism in the garden adds layers of meaning and communication to the garden for the viewer. The sources of symbolism and reference are varied drawing on religion as well as cultural references. The various signs, symbols and references contained and used in the gardens are a language of their own, they were incorporated into the garden fabric, in order to allow the viewer the space to ‘travel’ through his imagination. The garden lays out a certain set of moulds into which the viewer is invited, through intuition, belief and imagination, to add his or her own contribution. This is then a coming together into Unity, garden and viewer fusing, the one beginning to flow into the other, with the flowing comes a healing. Which was after all, the primordial purpose of garden space.